The second GetReal General Assembly was hosted by the ISPM and University of Bern the 28-29 of January 2015. 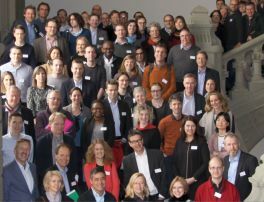 More than 100 participants from France, Italy, UK, Netherlands, Germany, Belgium, Switzerland and other European countries came to Bern to present first results of their work on incorporating real-world data into the drug development process. During these two days of intensive discussions and group workshops in the university main building, the network between academia, industry, HTA and regulatory agencies was consolidated, and strategies to achieve the goals of the project were developed. Matthias Egger, academic lead of the work package in charge of evidence synthesis and predictive modelling and leading the research team in Bern, invited the participants to join a city tour to the old town of Bern and the conference dinner in the restaurant of the Kornhauskeller.